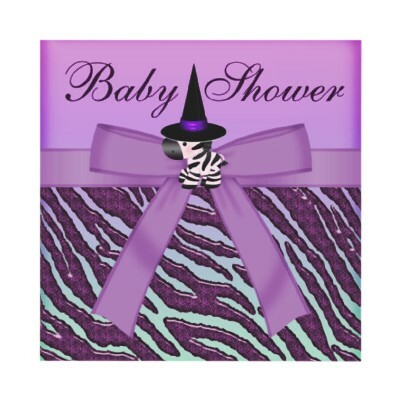 Cute and stylish personalized pink and purple zebra animal print girls purple, lilac and blue Halloween Baby Shower invites with a pretty digitally printed lilac ribbon and bow with a beautiful and cute little Zebra in a witches hat. These elegant invites are decorated both sides. Beautiful, cool & classy, modern invitations. Please note:: All products on Zazzle are printed – there are no real bows, fur, jewels, glitter, raised parts or additional pieces – ALL products have flat printed images. Text, font and color of font are all customizable.